Inside: Magic reindeer food that the kids will love. It’s super easy to make, and finish it off with this gorgeous free printable tag containing a reindeer poem. The kids will be so excited to leave the food for the reindeer’s. Add some extra sparkle on Christmas eve and start a new tradition with the kids. Download your free printable labels now. Do your kids leave out cookies and milk for Santa on Christmas eve? Santa is very well catered for with mince pies, cookies and milk. The list goes on. But, have you ever stopped to think about the reindeer’s? Magic reindeer food is an absolute must for Christmas. Santa get’s all the glory on Christmas eve as he is the one delivering the presents. But, the reindeer’s are the ones pulling the sleigh. Without the reindeer’s Santa would not be able to deliver all his presents on time. If you think about it, where would Santa be without the reindeer’s? Christmas eve would be a total disaster. So it’s pretty important that the reindeer’s are taken care of. Sure you could leave out a carrot or two, but this is generally for Rudolf. What about the other reindeer’s? This year you can help keep the other reindeer’s happy by leaving them some magic reindeer food. The reindeer’s will be able to have a good munch whilst Santa deliver’s the presents. The moon will help it twinkle bright. Exactly where to find your home. Kids will love having the little poem read to them and reading it out as they sprinkle the food on Christmas eve. You can use your imagination when it comes to the food you will use, and you can be as creative as you like. For these bags I simply used rolled oats, some small red beads and green glitter. Mix it all together, place in a clear bag, tie with a ribbon and attach the reindeer label. It couldn’t be easier! Keep it somewhere safe until Christmas eve then sprinkle the magic reindeer food outside just before the kids go to bed. The kids will love being able to sprinkle this special reindeer food onto the lawn or drive away and it will all add to the anticipation of Christmas eve. Of course, if you want to make sure that the reindeer actually eats the food, you may want to sprinkle it somewhere that you can easily clear up and dispose of it, so the kids don’t see it in the morning. Remember to leave a few pieces of the oats around though. I like to sweep a few pieces away to make it look like the reindeer’s were messy eaters! If you want to go the extra mile, you could even leave some of Santa’s footprints behind. They are partners in crime after all! If you are having a Christmas party and lots of families will be attending, this would be the perfect party favor to give the kids as they leave. They are incredibly simple to put together, but will spread a lot of joy. These reindeer food tag printable’s are available for FREE in TWO sizes from our free printable library. 10 x 6 cm with four to a page or 8 x 5 cm with 9 to a page. Print off which ever size is more appropriate for your needs. For a great quality finish on your printable’s, I recommend to print onto matte photo paper. Now that you have everything you need to feed the reindeer’s on Christmas eve, don’t forget to actually follow their path with Santa on the Reindeer Cam! I hope you and the kids enjoy this on Christmas eve. What traditions do you like to do with the kids on Christmas eve? Let’s stay in touch. 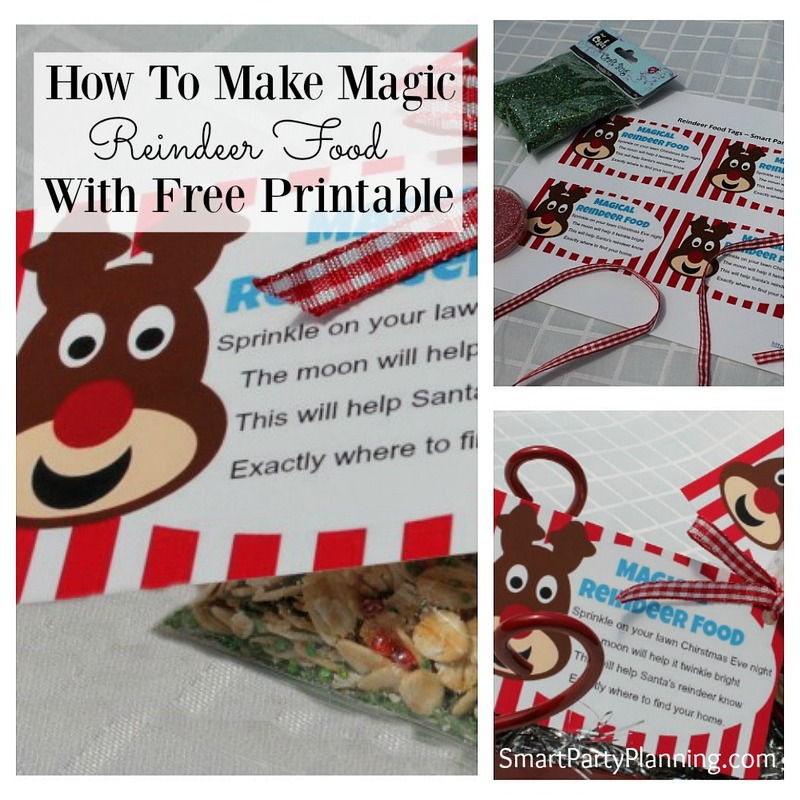 Do you love the idea of this magic reindeer food? Sign up to the newsletter so you can be kept updated with more easy Christmas, recipe and party ideas. You will also have access to a ton of other free printable’s like this one.